Symbian Guru has the lead on previously unheard of Nokia phones, the N81 and N82, which will both supposedly launch during Q4 2007, and have some pretty fantastic specs. First, the sliding N81 will have 8GB of flash memory, N-Gage gaming, a 2-megapixel camera, quad-band EDGE and HSDPA, Wi-Fi, Bluetooth 2.0 with A2DP, and will run the Series 60 3rd Edition. 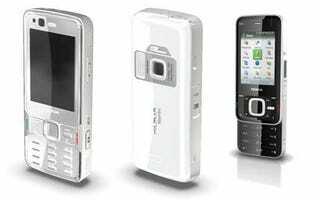 The N82, on the other hand, is a candybar phone with quad-band GSM, HSDPA, Bluetooth 2.0 with A2DP, Wi-Fi, GPS, TV-out, FM radio, microSD, front VGA camera, 5-megapixel back camera with Carl Zeiss lens and auto focus, and will also be running Series 60 3rd edition. Seeing as the specs on both these phones are so high, we wouldn't expect it to go for anything less than what you're seeing for the other high-end N phones.